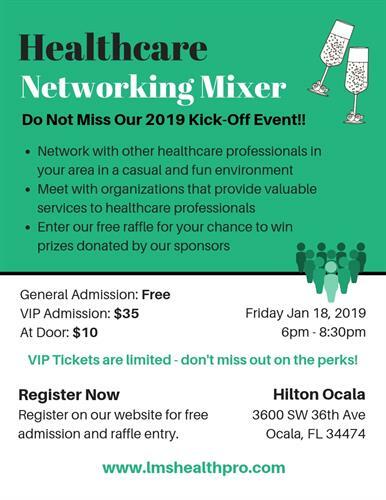 Start 2019 off right by joining us at our January 18th Healthcare Networking Mixer at Hilton Ocala! 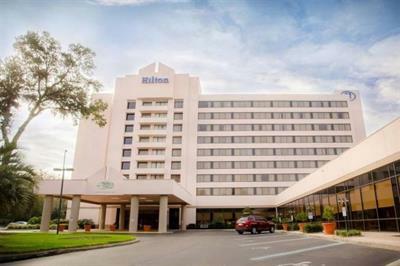 Network with other healthcare professionals in your area in a fun and relaxed environment. We will also be spotlighting selected companies that offer beneficial services to healthcare professionals and businesses. Each registrant will automatically enter our raffle for a chance to win prizes donated by our vendors and sponsors - including a brand new laptop! Must be present at time of raffle (7:30pm) to claim prizes. Free Admission with registration prior to 01/18/2019. $10.00 at door without registration. Limited number of VIP tickets available - check out the perks! Includes: Two (2) Drink Tickets, Three (3) Raffle Tickets, VIP "Goodie" Bag. VIP Registration closes on 01/11/2019.